SIP+ Data acquisition offers simple, fast data acquisition to improve building performance. Capable of handling huge quantities of data, it’s an enabler for detailed analysis of building performance. This data analysis can identify patterns and trends in energy consumption, unlocking a future of energy savings. Please enter email address to be emailed download link. SIP+ for Data Acquisition is an enabler for anyone wanting to conduct data analytics for building performance. It’s a simple solution for a complex process; an ‘engine management system’ for today’s intelligent buildings. What sets the SIP+ Data product apart is the volume of data it can handle, its speed of operation, and the variety of information feeds it can process. It captures “big data” if you want everything but also allows you to select and capture the “smart data” specific to your requirements. SIP+ Data establishes high volume, real-time data exchange between the connected networks and a system, individual or external data analytics partner. 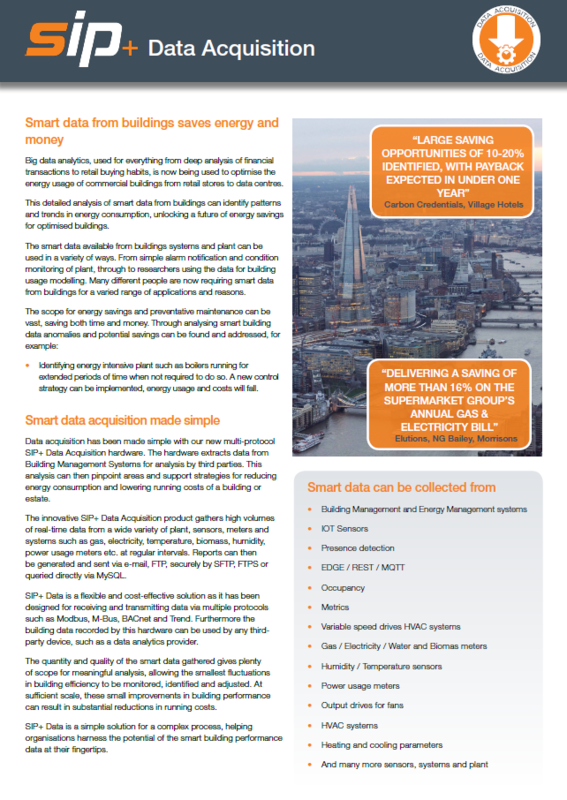 The quantity and quality of performance data gathered gives plenty of scope for meaningful analysis, which can identify where building optimisation and energy savings can be identified. The device collects values from an M-Bus, ModBus, BACnet or Trend Network and MQTT enabled devices taking multiple readings from around a building or estate at a minimum of 5 minute intervals (more typically every 15 minutes). The data collected is sent in report form via email, FTP, SFTP, FTPS or queried directly via MySQL. The device also provides a Trend BMS network diagnostic (metadata) report via a specially created profile. 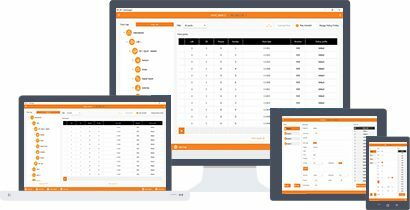 This functionality can prove to be very useful where the building or estates BMS network may not be reliable and therefore faults can be pinpointed and rectified. Available in 500 / 1000 / 2000 / 4000 / 6000 input point variants and are fully compatible with our SIPslice M-Bus and SIPslice Serial products making it even easier to integrate your building plant and systems. Commissioning of the device is via our new SIP Tool which has been specially developed to make the commissioning as easy and efficient as possible. This tool can be downloaded for free from our SIP Integrator support website.